Shorts in flowery material, Pattern: still to find; Purple Gingham Sorbetto; Lace top, Self drafted Pattern; Blue/black Paisley material, Self drafted long shorts. 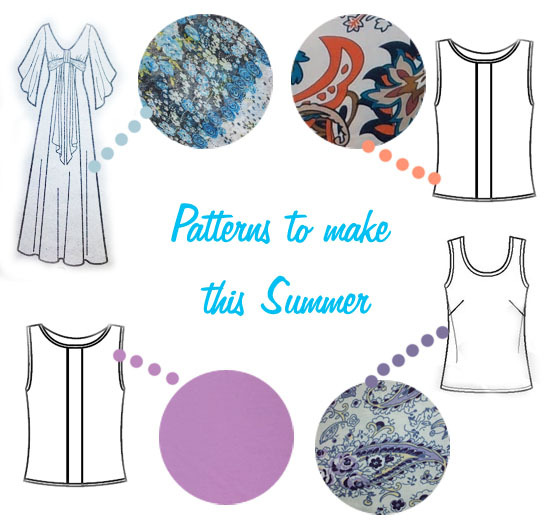 What are you sewing this summer? On a side note, we have broken the 1000 page views barrier 😀 I know some blogs have more subscribers than that but it is a small mile stone for us! What blog milestones have you broken recently? Ah thats a lovely achievement. Congratulations. Well this is a thought that is currently swirling round my head. I like the way the pattern uses bands instead of hems etc. I think I will give it a go and see what happens. This may take a little while but it will happen! Good luck! I was wondering about how to finish the armscyes on a sleeveless Renfrew. The bands = no hemming really is the best part of that pattern! I don't really know but I was thinking of trying to see if it would work with a similar band to the neck line, maybe a little narrower. If it would hold up.